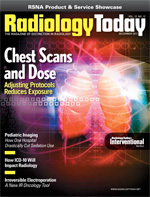 Researchers have outlined strategies for how to optimize radiation dose for chest CT, a commonly performed exam and one that exposes some of the most radiosensitive organs in the human body. Children’s Hospital of Pittsburgh employed some creative and kid-friendly techniques to distract patients from the reality of medical imaging. Not only did the facility see CT procedure volume increase 18%, but sedations for such procedures dropped 97% within two years. This interventional oncology procedure may provide a more precise alternative to radio-frequency ablation in some cancer patients. Providing quality service to both patients and referrers may be the most important component to a successful imaging organization. Imaging facilities may be able to cut costs and improve service by making the traditionally fixed expense of staffing resemble a variable expense by splitting some full-time jobs among several part-time workers. Breast imagers are still sorting out the most effective use for DBT and where fits into their screening and diagnostic imaging regimen. The authors of three Radiation Therapy Oncology Group trials recently spoke with Radiology Today about the studies and their significance. 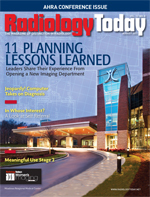 Read about one hospital’s solution to managing mammography films in its move to digital breast imaging. 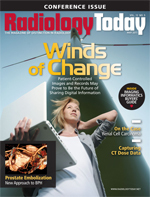 Like filmmakers, radiologists and other physicians are learning how to use 3D visualization technology effectively. 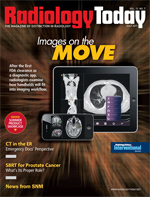 For teleradiology or other groups doing only outside reads, a Web-based information system may make more sense than RIS. IBM’s Watson uses Nuance language processing technology in a collaboration that seeks the end result of a diagnostic computer. Radiologists offer their take on how MIMvista, the first mobile application to receive FDA 510(k) approval as a diagnostic app, will fit into imaging workflow. Recent data have illustrated CT’s increased usage in the emergency department, although radiologists and emergency physicians often view the risks and benefits of such increased radiation exposure differently. We’ve compiled some noteworthy news from the SNM annual gathering in San Antonio last month. Early results appear promising, yet critics in radiation oncology say longer-term data are needed before widely offering the treatment to men. Imaging Associates of North Mississippi Magnolia found a way to get maximum use from less-than-maximum bandwidth, allowing for improved communication among providers in the network and better patient care. 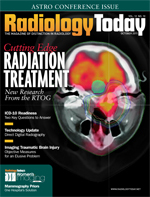 Read about some of the latest CT and MR news presented during the recent American Roentgen Ray Society annual scientific meeting in Chicago. Last year, the popular TV doctor recommended that women request thyroid shields to wear during their mammograms. His message went viral and ultimately led to a debate with radiology experts in an April episode. 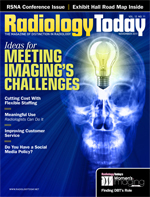 A Connecticut radiology group uses computer-aided detection to bring specificity to the sensitivity of breast MRI technology. A National Institute of Biomedical Imaging and Bioengineering project currently under way is attempting to provide a new model for exchanging patient records in which patients exhibit more control. New research looks at the possibility of shrinking enlarged prostate glands the same way interventionalists treat fibroids, with the potential to reduce complications commonly associated with current treatments. 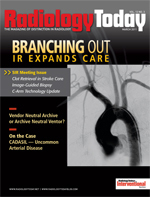 Here’s a sampling of some news worth noting from the latest annual meeting of the Society of Interventional Radiology. 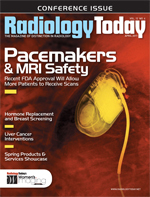 A recently approved pacemaker can be used in 1.5T scanners; hospitals and imaging centers are adjusting to the idea that patients with these implants can be scanned safely. The ISET Symposium on Clinical Interventional Oncology examines catheter-based treatments for hepatocellular carcinoma. Ultrasound elastography is increasingly being used to characterize breast lesions and, more recently, in other applications. The Million Women Study looks at how hormone replacement therapy affects breast cancer risk, and women’s imaging centers consider how it may impact screening. Radiation Dose: What Is Too Much? Separating the archiving component from the rest of a PACS can give you more control of your data and ease migration headaches. But is that the responsibility of the archive or the PACS vendor? Our annual look at what’s new in C-arm technology. A new system for visualizing needle placement can give physicians greater accuracy and confidence in performing these procedures. The TREVO 2 trial looks at a system for removing clots after ischemic strokes. 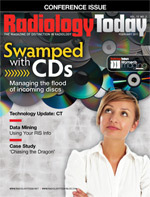 Patients routinely arrive with images on CDs. This article looks at how facilities can develop policies to manage those images and discs. 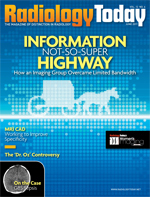 Our annual look at what’s new in scanner technology. Obesity and osteoporosis, ultrasound elastography, preoperative breast MRI, and the value of patient support systems in decreasing breast cancer mortality are topics discussed here. Neuroradiologists and neurologists are using fMRI in an attempt to unlock the secrets of autism. 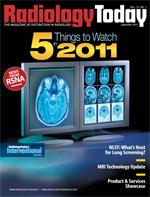 A look at some interesting radiology research from RSNA 2010. 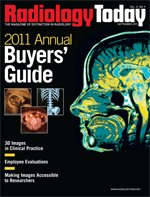 Take a look at some of the latest products and services available in the MRI market. Dose reduction and teleradiology’s evolution are just two of the five things that bear watching in the coming year. The NLST showed a mortality benefit for screening certain smoking populations with CT scans. What remains to be seen is whether and how those results will translate into screening recommendations. Much of the research presented at last fall’s ASTRO meeting focused on ways to better image and treat prostate cancer.